As a precision metal manufacturer of high volume industrial fabrications, our talented and capable team have a great deal of experience in the manufacture of metal enclosures and electrical component parts for clients across many industries including those in the IT/Electronics, Rail and HVAC sectors. And as such, we are very aware of, and manufacture to, strict industry safety standards, with our IP65 rated steel enclosures and their components being a good example of this. 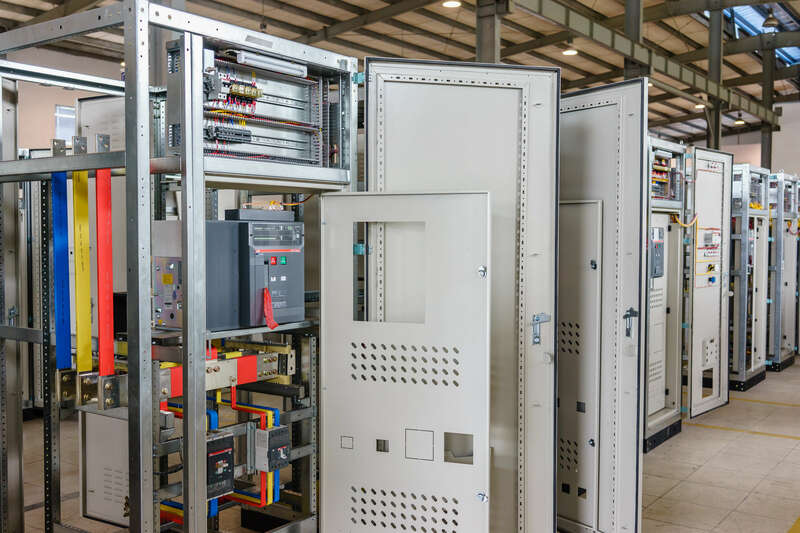 When manufacturing components in high volumes for electrical enclosures, we take great care in ensuring that they will operate safely. One particular precaution that we take uses a ‘louvre’ punching tool to optimise airflow and prevent overheating. Liaising with our design team, your account manager will work with you to troubleshoot potential safety issues in your product, and present suitable solutions to ensure that your lighting and electrical components are safe. We manufacture a wide range of non-IP rated and IP rated metal enclosures for clients’ electrical needs and we will always work closely with them to ensure that the product we manufacture meets their exact specifications, on time and to budget. The benefit of us being a manufacturer rather than simply a supplier means that we can offer you greater flexibility in the type of metal enclosures you may need, or indeed if you simply need us to design and manufacture components to sit inside UK electrical enclosure boxes that you already have, then we can do this too. Here at JC Metalworks, every sheet metal product that we produce in high volume for lamp parts or lighting components, heat pumps, switch blocks and other electrical purposes undergoes a first-check by our experienced Quality and Assurance team. This examination ensures that the first product of every run works perfectly and meets your exact specifications. As such, you can always be assured of the high quality of sheet metal lighting components that we manufacture. We also offer final product assembly services, where our team can assemble your lighting components in addition to electrical parts or components manufactured from other materials, such as plastic, wood or glass into the finished product, saving your staff from taking on this task. Overall, our assembly service ensures that your components or completed products are ready for delivery. In addition to the manufacturing of lighting and other electrical products for the IT and Electronics industries, we are highly skilled and experienced in manufacture of elements for the HVAC (heating, ventilation and air conditioning) industry, manufacturing items such as heat pump enclosures and multi service chilled beams. To learn more about how our team of expert precision engineers can manufacture metal enclosures and lamp parts please contact us using our contact form or 01509 23328 and we’ll be happy to help.